Sudden Cardiac Arrest (SCA) is a leading cause of death in the United States, accounting for an estimated 356,000 deaths each year (SCA kills nearly 1,000 people a day or one person every two minutes). Survival rates nationally for SCA are less than 11%.1. Delivery of CPR is life-saving first aid, and can sustain life until paramedics arrive by helping to maintain vital blood flow to the heart and brain. Only about a third of SCA victims receive bystander CPR. Without oxygen-rich blood, permanent brain damage or death can occur in less than 8 minutes. After 10 minutes there is little chance of successful resuscitation. Even in modern urban settings the response times for professional rescuers commonly approach these time frames. The American Heart Association estimates that effective bystander CPR, provided immediately after sudden cardiac arrest, can double or triple a person’s chance of survival. SCA can happen to anyone at any time. Many victims appear healthy with no known heart disease or other risk factors. The free PulsePoint app is available for download on iTunes and Google Play. PulsePoint (SaaS) cloud service resource, and PulsePoint Connect. One version of the PulsePoint Respond app (on each platform) support all agencies. maintained by the PulsePoint Foundation. Also available is PulsePoint AED, a free companion app for strengthening the chain of survival for cardiac arrest victims. Members of the community download PulsePoint AED and use it to report and confirm AED locations. They simply describe a new location, snap a picture, and the information is stored for local authorities to verify. After that, the AED location data is made available to anyone using PulsePoint Respond. PulsePoint Registry provides complete control over the community’s Public Access Defibrillation (PAD) program. Tightly integrated with both PulsePoint Respond and PulsePoint AED, PulsePoint Registry provides a simple workflow to manage critical registry tasks. PulsePoint Registry also provides the capability to integrate all collected community AED information directly into the dispatch system map—on existing console monitors. The foundation provides PulsePoint Registry free of charge to connected agencies. The Health Insurance Portability and Accountability Act (HIPAA) protects the privacy of individually identifiable health information. 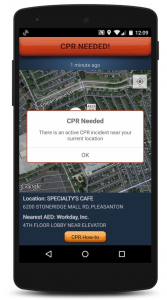 On a ‘CPR Needed’ notification, the app reports only an address (in a public place) and a business name, if available. Individually identifiable health information, such as name, birth date, or Social Security Number are not reported or known to the PulsePoint application. In addition, PulsePoint has retained Page, Wolfberg & Wirth, LLC to assist agencies understand legal issues related to the implementation of PulsePoint. PWW is well respected EMS law firm specializing in dispatch liability and HIPAA issues. CPR today is very easy to perform and can be learned quickly in informal settings such as community street fairs, group training sessions, take-home DVD-based courses, or even by watching brief online videos. These types of training environments do not provide certificates of other forms of skill documentation. Automated External Defibrillators (AEDs) actually require no training to use. Therefore, there is no reason or even ability to verify that someone volunteering to help others with CPR or an AED has been formally trained. Learn how you can help save a life in this one-minute American Heart Association video showing Hands-Only CPR in action. What does a CPR notification look and sound like? A CPR notification arrives as a normal push notification. This notification will be accompanied by a distinctive alert tone. Opening the notification will load the PulsePoint app. The screen will display your current location, the general reported location of the cardiac arrest victim, and any nearby Automated External Defibrillators (AEDs). To receive a CPR Needed activation you must have the CPR notification type selected in the Settings Menu and you must be in the immediate vicinity of a reported cardiac arrest. Notification radiuses vary by jurisdiction. Only about a third of Sudden Cardiac Arrest victims receive bystander CPR, and public access Automated External Defibrillators (AEDs) are used less than 3% of the time when needed and available. The current situation is far too few bystander rescuers – not too many. The goal of the app is to engage additional bystanders in these lifesaving acts. If this situation was to truly materialize in the future it would be a major success and the radius of the notification could be reduced. For the app to be activated someone must first call the local emergency number (such as 911) to begin a normal public safety response. This means that the victim is likely not alone when the CPR/AED notifications are made. In addition, the app is only activated for incidents occurring in public places (not at someone’s home for example) furthering the likelihood that others will be present. Also, since the app is only activated on devices in the immediate vicinity of the victim, a “Bad Samaritan” would have little opportunity to be in the right place at the right time. With dispatchers making rapid over-the-telephone assessments of patients based on the observations of untrained callers, an incorrect determination can be made. For example, such a situation could occur with someone who has just had a grand mal seizure, passed out from too much alcohol, or has a very high blood sugar. However, if you tried to do CPR on such an individual he or she would probably moan and possibly even try to push you away. Also, an AED would not deliver a shock to a person in any condition where an effective heartbeat was present. Typically PulsePoint queries public data sources such as the Residential/Commercial Indicator (RDI) from the USPS (PulsePoint uses the USPS address validation API from SmartyStreets) along with other sources such as the Google Places API to make this determination. How is the PulsePoint Foundation funded? The PulsePoint Foundation is a 501(c)(3) nonprofit organization funded through a combination of license fees paid by adopting agencies and donations from private individuals and charitable foundations. Key sponsors include Workday, The Wireless Foundation, and El Camino Hospital. Learn more about the foundation. · The free app is available for download on iTunes and Google Play. PulsePoint is a 501(c)(3) non-profit foundation based in the San Francisco Bay Area. Through the use of location-aware mobile devices, PulsePoint is building applications that work with local public safety agencies to improve communications with citizens and off-duty personnel, empowering them to help reduce the millions of annual deaths from sudden cardiac arrest. The free app is available for download on iTunes and Google Play.